Birding Is Fun! : Marbled Godwits are on the move in the LCRV! Marbled Godwit in Cibola, AZ on 10 April 2013. iPhone photo by Tim Schreckengost. Marbled Godwits, Limosa fedoa, are uncommon to rare spring migrants from late March to early May through the lower Colorado River Valley (LCRV). The previous high count for spring was 180 birds on 29 April 1952 at Topock Marsh (Rosenberg et al. 1991). More recently, there was a count of 83 birds on 9 April 2011 at Rotary Park (eBird 2012). Marbled Godwit spring records from March through June for the past 10 years (eBird 2012). I've only seen Marbled Godwits a few times in the LCRV. My first was at Rotary Park in Lake Havasu City, AZ on 31 March 2012, where two birds were observed with a flock of 27 Long-billed Curlews. Marbled Godwit (bottom) and Long-billed Curlew (top) in flight at Rotary Park in Lake Havasu City, AZ on 31 March 2012. Photo by Tim Schreckengost. April is prime time for shorebird migration through the LCRV, so I stop and scan flooded fields and mudflats whenever possible. I lucked out yesterday, 10 April 2013, when I spotted a flock of four Marbled Godwits along Baseline Rd. in Cibola, AZ. As we were watching the birds a fifth bird flew in! Marbled Godwits in Cibola, AZ on 10 April 2013. iPhone photo by Tim Schreckengost. This sighting was my first for La Paz County, so I was extremely stoked when I entered it into eBird. You do eBird, don't you? This evening, two members of our field crew were birding the area around our house and spotted another flock of Marbled Godwits sitting on a sandbar a hundred or so meters from the house! I strolled down and counted 31 birds. This was my first sighting in Riverside County. Again, I was stoked when I entered it into eBird! It's shaping up to be a great spring for Marbled Godwits in the LCRV! 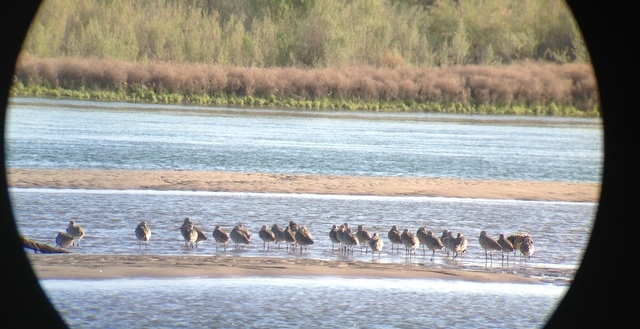 Marbled Godwits near Blythe, CA on 11 April 2013. iPhone photo by Tim Schreckengost. Although distant, I did obtain a couple of subpar shots with my iPhone 4s and Celestron Regal 80 F-ED Spotting Scope. I used a Phone Skope (Robert reviewed his adapter here) adapter and took video grabs using an app called StillShot, which I highly recommend. Drew Weber of Nemesis Bird wrote up an excellent piece in this iPhone Digiscoping Pro Tip. 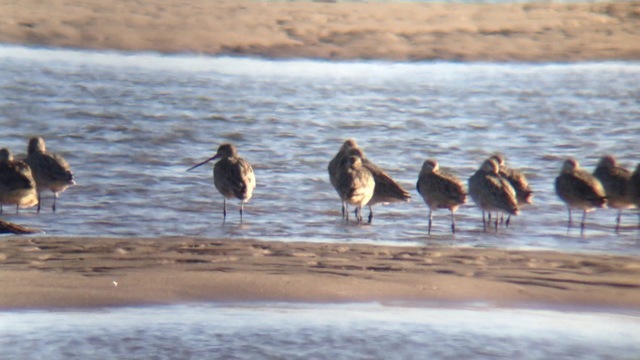 All of the photos, except for the Marbled Godwit and Long-billed Curlew, were taken using the iPhone 4s, Phone Skope Adapter, and the StillShot app. If you haven't tried digiscoping with your iPhone, you should really start. eBird. 2012. eBird: An online database of bird distribution and abundance [web application]. eBird, Ithaca, New York. Available: http://www.ebird.org. (Accessed: April 11, 2013). Rosenberg, K.V., Ohmar, R. D., Hunter, W.C., and Anderson, B. W. 1991. Birds of the Lower Colorado River Valley. Univ. Ariz. Press, Tucson. I have always been intrigued by digiscoping, but have never tried it. The iphone technique sounds so very interesting. Love your images and post. 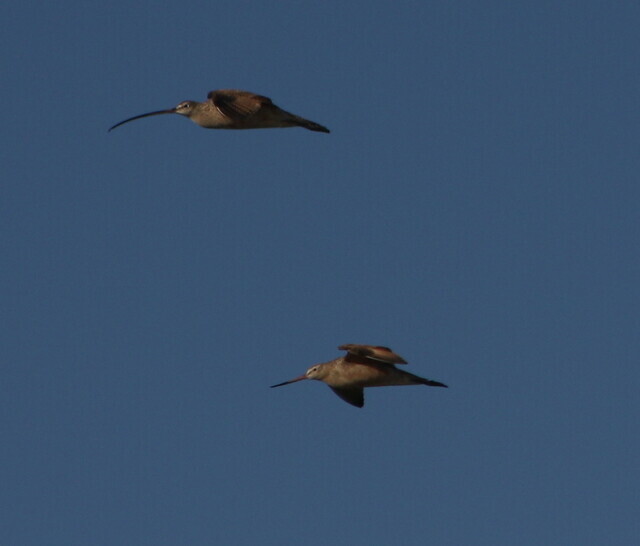 I also appreciate the flight shot sharing the difference between the Marbled Godwit and Long-billed Curlew. Debbie - thanks for checking out the post! Digiscoping is more convenient than carrying around a DSLR. I still carry my camera around when looking for songbirds, but digiscoping is great for shorebirds, ducks, etc. You should give it a shot! simply beautifully captured shots ...lovely! The Marbled Godwit and Long-billed Curlew is an amazing shot! Wonderful info and amazing shots with a cell phone! Congrats on your sightings and yes, I eBird...religiously! It's always fun to be able to add a new species onto your county and/or Life List, plus to be able to accurately document it!